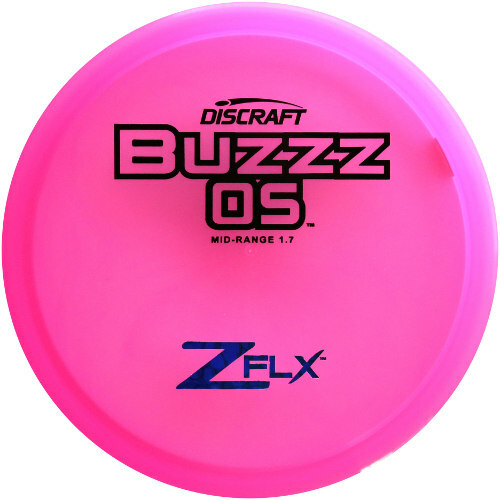 The Discraft Z FLX Buzzz OS is an overstable mid range driver (1.7). Players have depended upon the ever popular, dependable, consistent, controllable and accurate Buzzz for a wide range of shots. But the Buzzz OS is beefier. It's a great mid range disc in a headwind, when you need a straight shot with a hard finish and one you can depend on for straight forehand shots. This disc golf driver is best for experienced players. Z FLX plastic - With added 'give,' Z FLX discs are easier to grip for more controlled releases, especially in cold or wet conditions. The discs will flex under pressure without being spongy and instantly snap back into shape to retain their flight characteristics. Fewer kicks and skips. Very nice in rain and ice!